One of my most gratifying accomplishments in comedy was when I was booked at Caesars Palace in Las Vegas. Playing Vegas was the pinnacle of my career, inasmuch as it was always defined at the entertainment capital of the world. Even as a child I knew Las Vegas was where the great ones performed. So in 1984 I was opening for Paul Anka at Caesars, and I was in shock and awe as I stood on the Las Vegas strip and looked up to see my name on the huge iconic Caesars Palace marquis. It was thrilling to know that in a few hours I would be walking out on the same stage that Frank Sinatra had been on one night earlier. On opening night I stood in the wings, minutes before my introduction, when something totally incredible happened. The stage hand told me there was a problem raising the main curtain. You see, the pre-show curtain at Caesars was actually a heavy steel corrogated contraption, which had to be opened hydraulically to get to the main regular curtain. And the mechanism apparently had broken. So I was given a choice. That was it? I could not believe what I was hearing. I was about to make my debut at the most famous theatre in the world and they couldn’t get the curtain to open! I was not about to come in through the showroom entrance and prance down the aisle to the stage. This felt to weird for me to do, running down toward the stage and climbing up on it while the crowd watched silently. So I chose the crawl method. 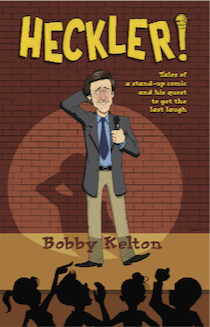 The lights went down, and a voice boomed, “And now, Bobby Kelton.” The crew hoisted the steel curtain up about a foot, and I crawled under it in my suit and tie, like a marine crawling under fire in a war. I got up, dusted myself off, and did my act. The crowd was laughing before I said a word, so essentially Caesars Palace provided me with my opening joke. When my act was over I turned and crawled back under the curtain. Of course, it was all fixed by the time Paul Anka came out minutes later. But for me I’ll always remember it as the grandest entrance and exit I’ve ever made in my career. Posted on February 25, 2013, in Showbiz Stories and tagged Las Vegas, Paul Anka. Bookmark the permalink. Leave a comment.